La Playita anchorage on the Panama City side of the canal is the only place where you can drop the hook for free, so it was a no-brainer for us to stay there after the pummeling our bank balance has had recently. 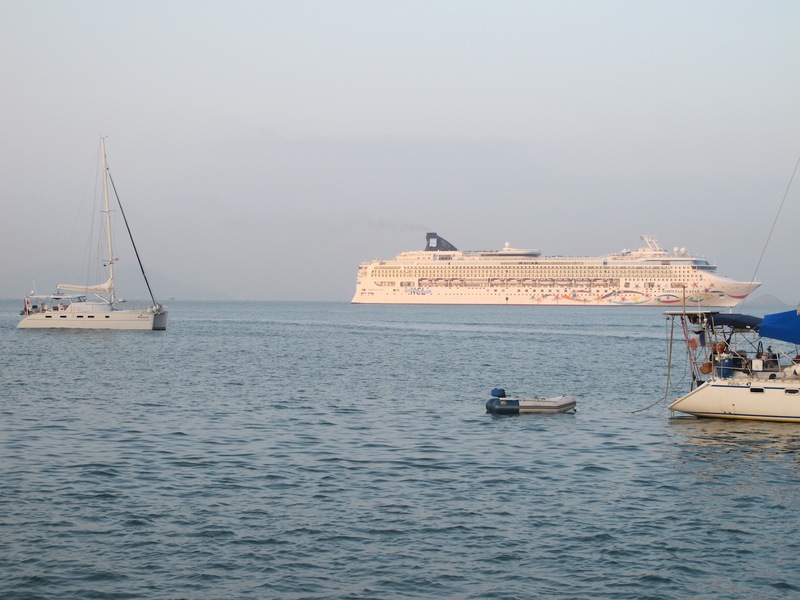 There is one cost though – the marina charges $35/week to use their dinghy dock. OK, fair enough and because we arrived on a Thursday and their week starts on Monday they charged us a pro-rata rate until the following Monday and we got our coloured wrist bands to prove we’d paid. So far, so good – we settled in for a bit of a rolly night with all the shipping coming in and out of the channel, but nothing bad enough to disturb our sleep. The next morning the welder who fitted our wind-generator pole in Shelter Bay was supposed to come to add another brace to the contraption. We waited, and waited and left numerous messages on his phone but by mid-morning we had to accept that he was a no-show. We really weren’t that surprised, it was just annoying wasting time when we had so many other things to do. He’d left the stainless tubing with us, so Bruce and Geoff worked out how they could attach the third brace themselves using a bimini fitting with hose clamps. It may not be the prettiest construction, but at least there’s less movement in the top half of the pole. There’d been so little wind in Shelter Bay and coming through the canal that we weren’t able to tell whether it was working, so when the wind piped up in the anchorage we were very keen to see those amps pumping into the batteries. Instead what we got was zip, nada, nothing. Bruce checked and re-checked the wiring to no avail. 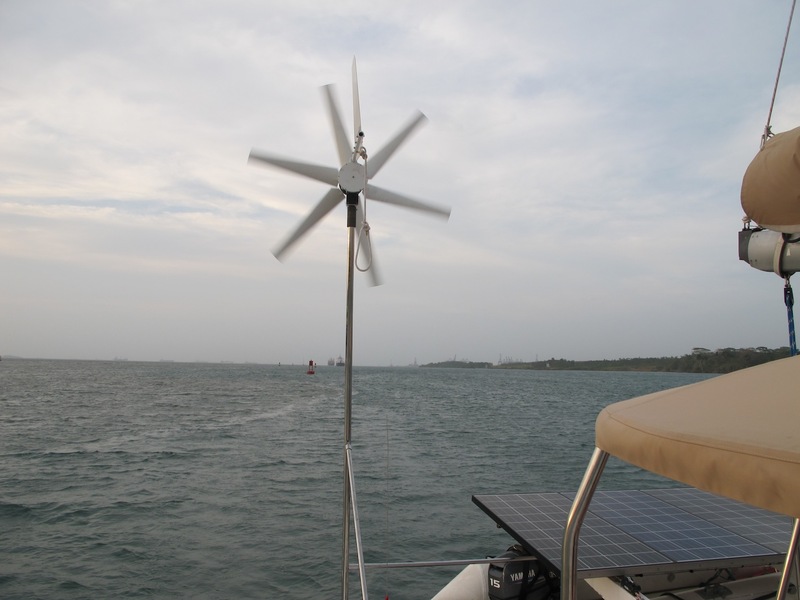 So at great cost we now have a lovely wind generator complete with stainless mount that generators precisely….zero! To cap it off, we’ve still had no luck getting our portable generator fixed. The part we need would take 10 days to get here, plus fitting time, and we just can’t delay our Pacific crossing any longer. So for now we’ll have to keep the batteries charged with the motors if the solar panels don’t give us enough juice, and try and sort out the other problems further down the line. Very frustrating to say the least. 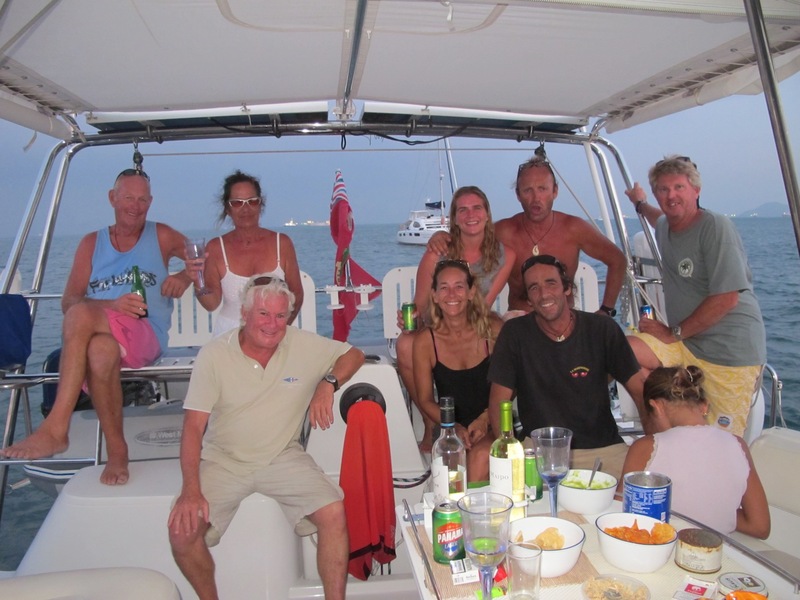 Thankfully we had our buddies on other boats in the anchorage, so the gatherings at sundowners helped drown our sorrows! We found a great taxi driver, Luis, who was used to ferrying yachties around town, so over the weekend we raced around getting spares for our engines and outboard, plus doing the last minute fresh food provisioning. The supermarkets on this side of the canal are much bigger and better stocked, so we managed to get most of what we needed without trouble. Luis even helped push the trolley for me, and acted as interpreter when I couldn’t find what I needed! Panama City is a strange place – the old part of the city is like a slum, and extremely unsafe. We saw police posted on almost every block as we drove through. But then at the other extreme is the modern section with the huge skyscrapers and fast-paced living. We didn’t have much time to sightsee, but it didn’t strike me as somewhere I’d want to spend much time anyway. It was smoggy and incredibly humid the whole time we were here. 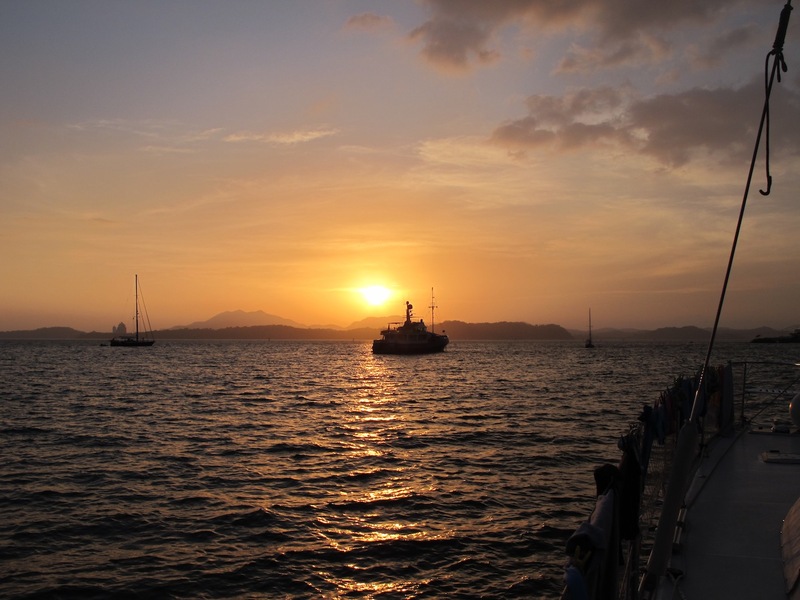 By now it was Monday morning and several of the other boats had already left for Las Perlas. We planned to leave in the afternoon because we still had to pick up the (unfixed) Honda generator from the dealers and check out with Customs, so Bruce went ashore one last time. His big mistake was forgetting to take off last week’s wristband. As he got back to the dock he was accosted by the marina staff who’d spotted the old wristband and asked him to pay another week’s rates for the dinghy dock. He says: “You’ve got to be joking, I’m leaving today, all I’m doing is stepping off your dock onto our dinghy and we’ll be gone”. She says: “Sorry sir, but you have to pay $35”. While Bruce argued the toss, Luis had taken the generator down onto the dock, and Geoff was bringing the dinghy in to pick up Bruce. The haggling continued, with Bruce offering to pay $5 pro-rata, and the Dock Nazi insisting on her full week’s dues. When Bruce refused, her response was “well, I’ll have to have you arrested then”. “OK, arrest me” says he, holding out his wrists to be cuffed – at which point everyone including the security guard looked baffled. While they were thinking up their next response, Bruce yelled down to Geoff “Get the generator in the dinghy and go back to the boat”. Geoff did as he was told, and sped off, leaving Bruce standing on the dock blockaded now by two or three guys in army uniform. With a stand-off looming, and not really wishing to be thrown into a Panama jail, there was nothing much for him to do except walk away – all the way down the road around the breakwater until he was well out of sight of the marina where he scrambled down the rocks, and signaled to us to come and pick him up! Not wishing to play the starring role in an Interpol manhunt, we decided it was definitely time to leave and upped anchor heading for Las Perlas. Oh my rebel skipper! This is the stuff of movie plots!!! Love it!